The staple. If you don’t have/haven’t had one of these lying around then you’re not a true 360 aficionado. And while these are no longer offered in brick-and-mortar stores new (being replaced by the S model) you can get them anywhere and everywhere else. Second only to its white and grey brother the classic Black controller was first offered with the equally black toned Xbox 360 elite. These are a dime a dozen, and while they too have been replaced by the new S model it’s not hard to track one of these down. Also known as the Resident Evil Red controller, these were offered both with a charge-n-play kit and as part of a special limited edition Resident Evil console. A lucky person can find one of these in their local used game store, but if you’re a sucker for red a better option would be to buy a replacement shell for an existing controller. While not officially known as such, “American” Blue controllers were only offered in the states. The rest of the world got the Light Blue controller, which in turn was not available to America. Bundled with Pro Evolution Soccer 2009, this controller has 16 way d-pad functionality instead of the standard 8. 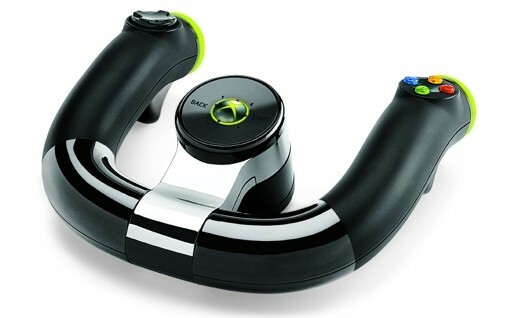 Not sure just how important that is, what with analog thumbsticks and all, but there you go. It’s not available in the states, making this little gem uncommon. Our recommendation, however, is just to hunt down a replacement shell instead of dropping more-than-retail price for it. This beauty was offered to the greater part of the world, but never in America. Finding even a Light Blue shell to replace an existing controller’s is difficult. If you’re a collector, one of these would make a great addition to the collection. The black S is essentially the same as the old model, with a few minor differences. The guide button now has an ultra cool chrome finish, the bottom plate is black, and the d-pad and thumbsticks are black. These are offered pretty much everywhere, so if you’re looking for one it’s best to buy it outright rather than re-shell one of your own controllers. One of the newest common controllers on the market isn’t quite so common yet. These are offered in stores, but stock seems to be trickling out slowly. It won’t be hard to find one, but if you’re looking for four matching controllers you may be out of luck. There’s a love-hate relationship with this controller for most people. The cool d-pad addresses accuracy issues, but the thumbsticks lack the four small nubs that keep your thumbs grounded. We recommend picking up a replacement pair of thumbsticks and going old school. While you’re at it replace those ugly silver ABXY buttons with colored ones. It looks much better. Released just this past October the Black Transforming D-Pad controller is available only in a charge-n-play kit. It’s basically a Black S with a transforming d-pad in it. You can find aftermarket shells like this, or have it done to your original black controller, both for about half the price or less. It’s Star Wars themed. That’s cool in and of itself. But it’s gold chrome, and that’s awesome. You also get the transforming d-pad and little 3P0-themed wires painted onto the bottom plate. It’s cool, but then again it was a Kinect Star Wars console exclusive. 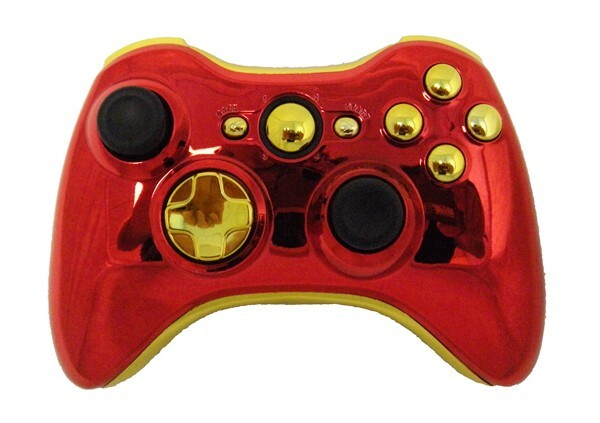 Unless you want to drop big money on a limited edition console odds are better looking for a custom gold chrome shell. Released in May this year, these are available, but expensive. You’re better off buying an aftermarket shell. Frankly there’s a larger selection of chrome colors to dress up including this sweet Iron Man-themed shell. Originally bundled with the Halo 3 console you can find replacement Halo 3 Green shells just about anywhere on the web. 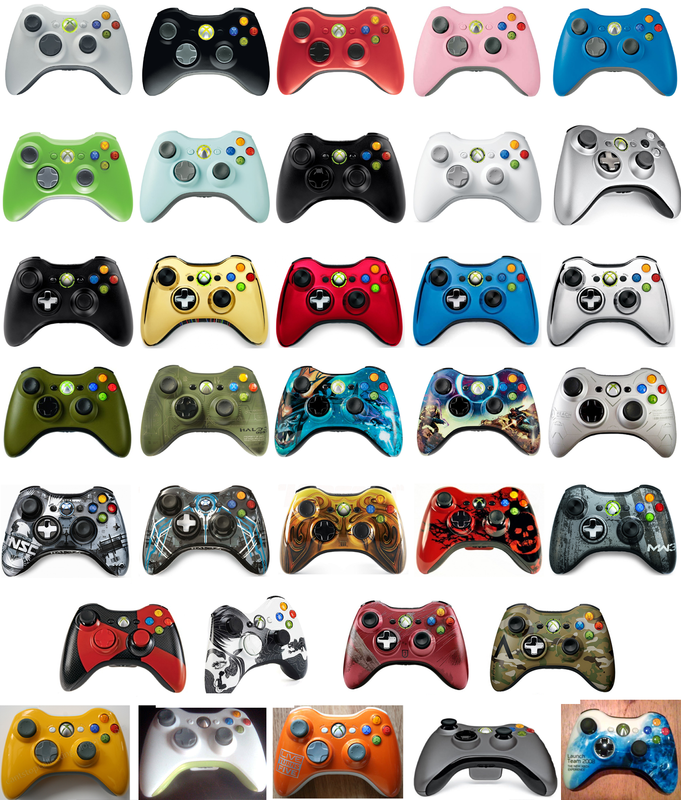 Our recommendation is to create a look alike with one of your existing controllers. The real McCoy is not only hard to find, but drown amidst a sea of copycats. These controllers can still be found through resellers on the web or on the street, but you’ll be hard pressed to find one still in its packaging. Finding stock replacement parts is difficult as well, but some of our favorite resellers still have a few on their shelves if you just want to refresh the look of your old controller. 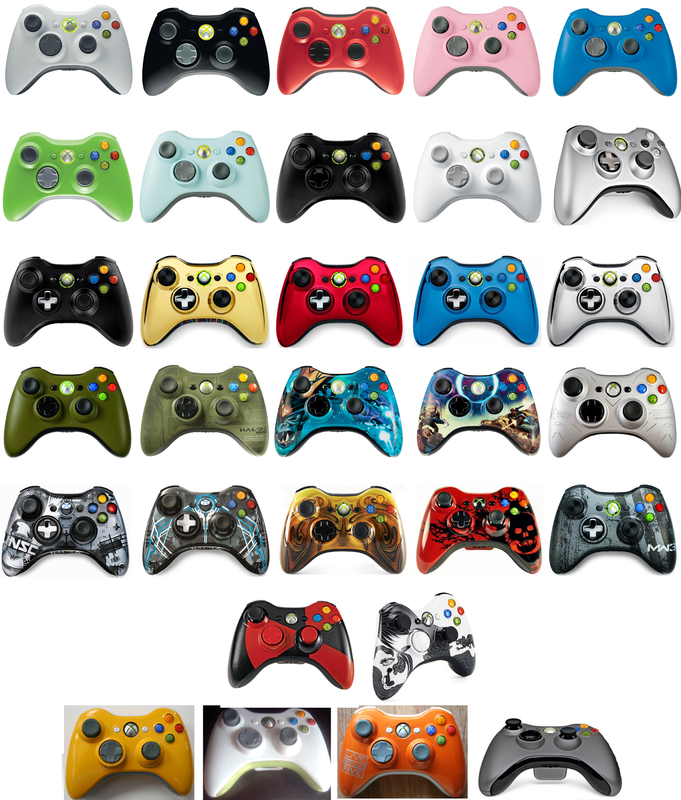 If you’re a collector and you see one of these controllers, drop your money right then and there. These are very difficult to find, and you won’t find replacement shells to transform your old controller into something new. These controllers were quite popular on store shelves or something, because these seem to be more available than most game-themed special edition controllers. They were reportedly available both with the limited edition Halo Reach console and separately, so that might have something to do with it. Sites that offer rapid fire conversions often keep these in stock as they seem to be a favorite amongst cheaters enthusiasts. You won’t find the shell separate anywhere, but if you’re itching for the controller you’re probably in luck. Technically speaking it’s still available via the Microsoft Store, but they’re rare because they won’t be around for very long. Resellers have been pulling the shells and selling them on eBay, but as of now all are sold, and some even went for more than the price of a new controller. Auctions apparently bring out the dumb in people. This is another ‘grab it if you see it’ controller. They were bundled with the limited edition Halo 4 console, and the last auction on eBay went for $105 USD. Rapid fire resellers will give you one, but you’ll pay up to 40% more of the eBay going price, and that’s an untouched model. This one is actually totally separate from the release of Fable 3. In fact, it came out close to three weeks prior to the game’s release. The only true Fable branding is a small roman numeral III at the bottom of the controller, so this is a great addition for someone who just wants a cool design. Oddly enough these shells can be found on eBay, and for a darn good price (about a fourth of what the controller itself might go for). It’s a Gears of War 3 controller. That’s a thing, right? This is only one of two non-Halo themed game controllers with a transforming d-pad, and it rocks a slick hydro-dipped paint scheme. You’ll pay a good chunk of money for it, though, and doing a shell-swap is unlikely. We don’t know of any place that has these replacement shells for sale. The other non-Halo game shell that features a transforming d-pad, this controller is, personally speaking, much more slick. 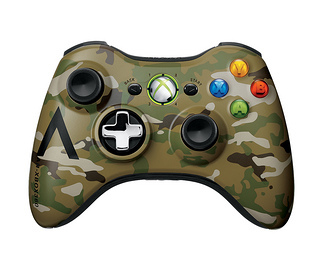 Even non-fans of the Call of Duty series have to admit that this controller turns heads. It is, however, yet another controller you won’t be able to shell-swap on. If you want this you’ll have to shell out the money for the real thing. As near as we can tell this was exclusive to GameStop/EB Games. The red and black design is offset by awesome red and black thumbsticks. They aren’t sold any more, and you won’t find replacement parts. Exclusive to Wal-Mart, and no longer made. As with the Radioactive these are unicorns and replacement parts can’t be found. Pretty, but impossible to find. Revealed shortly after this article was published, the Tomb Raider controller is the newest in the game-themed family. We don’t know yet how rare it will be or how quickly spare parts (shells) will show up in resellers’ stores. It is due out this March. Another Wal-Mart exclusive in the U.S., though unsurprising. We’re guessing this will sell well in the southern states. Kidding aside, it’s actually a pretty decent design, and includes the transforming d-pad. Outside of the states it will be available in “select regions”. Roughly 100 were made. They were bundled with a special Simpsons console. 99 are probably stored away in their respective owner’s fireproof safe. The last one some fool used as a ‘daily player’ controller. You can build something similar with third party yellow shells, but be aware that some distributors sell the cheaply molded versions. Given to very select members of the Xbox 360 launch team alongside a matching console. If you get one, a glass case would be an appropriate means of display. Genuine parts are impossible to come by, but you can recreate something close with custom parts available through most online retailers. These were given only to select members of press and Microsoft on the fifth anniversary of Xbox Live. If you get one, keep it in its little protective baggie. Given out recently to random members of Xbox LIVE who’d been faithful since the days of its inception. If you own one, resist the temptation to open the box. UPDATE: Reddit user GibGirl noted one controller was missing, the 2008 NXE Launch Team. It’s been added to the lead image, and the original can be viewed here. This controller with a custom skin was given to the Xbox team responsible for creating the NXE in 2008. It also came with a matching faceplate. You’re unlikely to ever have one, so commit yourself to do without. There are a handful of what might be considered insignificant variants of the above that the total purist may want to consider. There are two wired controllers, the classic white and the black S. Additionally some early white controllers had a different sheen to the bottom mic plate.